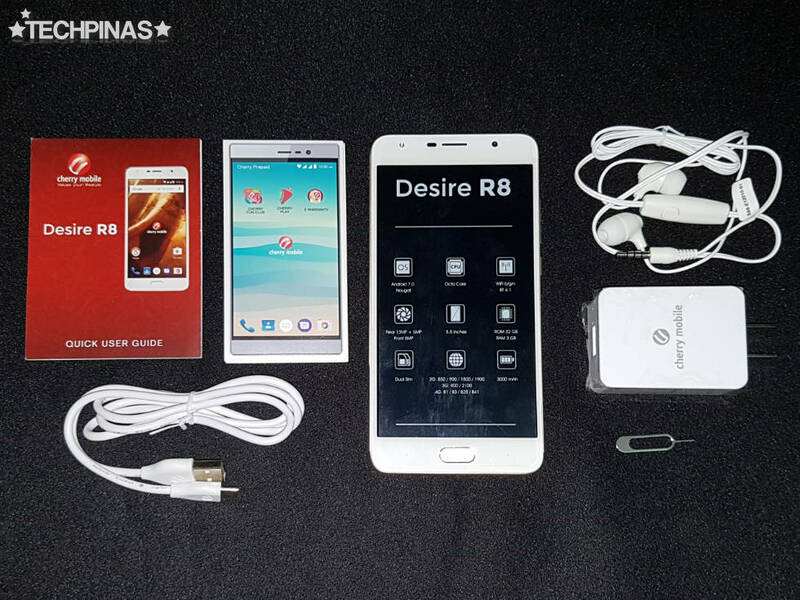 Cherry Mobile Desire R8 is currently the flagship smartphone or top-of-the-line release of the proudly Pinoy handset company. 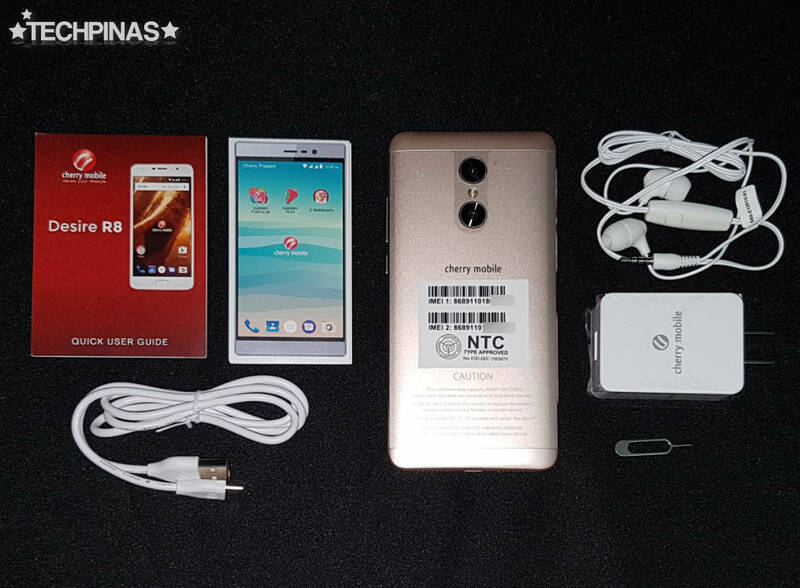 And as such, it has the best design and build as well as set of technical specifications out of all mobile devices that the brand offers as of writing. 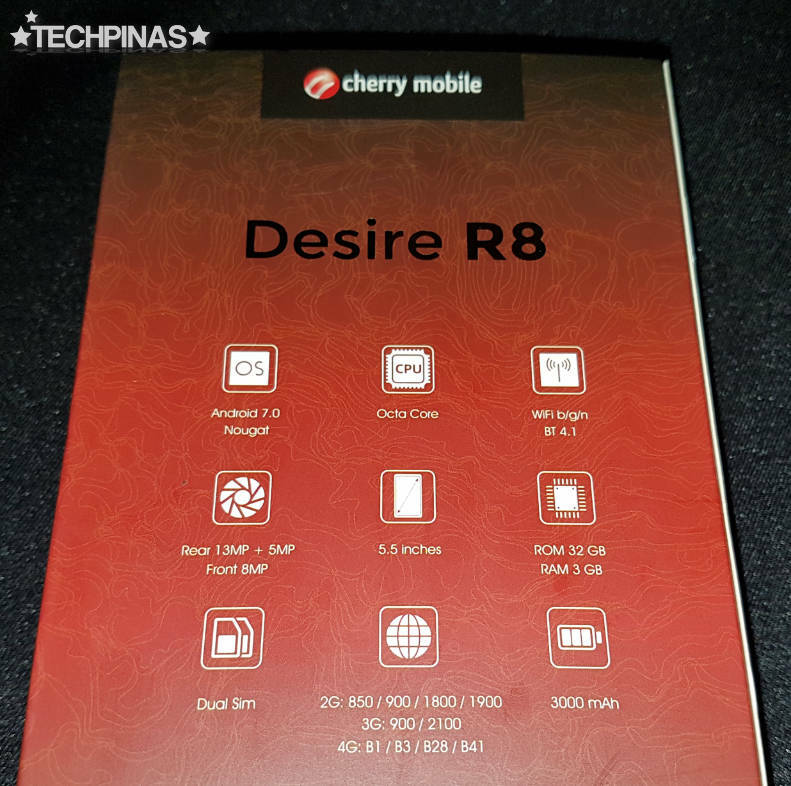 As a sign of gratitude to my readers and to allow one of you to fully experience the best that Cherry Mobile has to offer, I have decided to raffle of my own Cherry Mobile Desire R8 unit. Before I give you my mechanics for the raffle, let's do a quick unboxing of this cool model just to show you everything that you're getting. 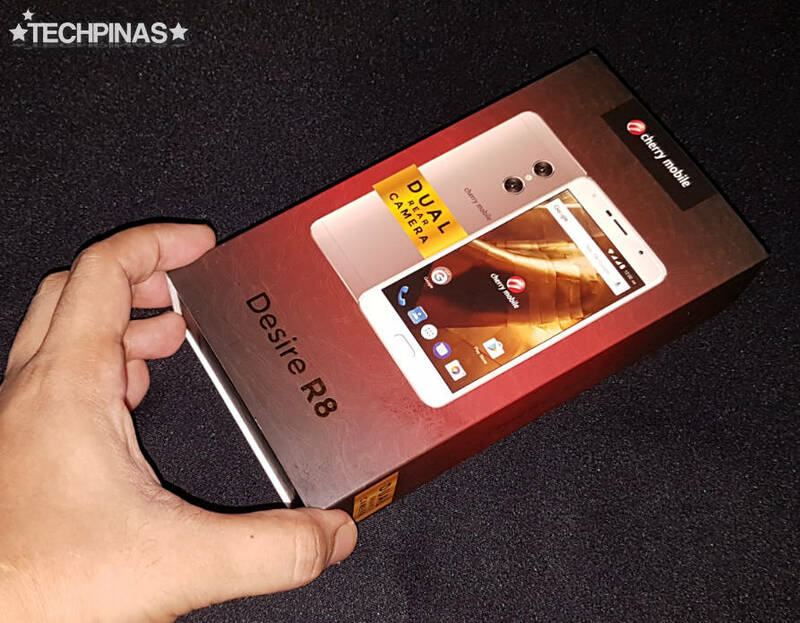 The Desire Series is the Cherry Mobile's latest line of premium line smartphones -- and that's well reflected in this phone's packaging. The outer sleeve has deep red, black, and gold hues that blend well together to exude an air of elegance. At the back of the outer sleeve, we find a list of Cherry Mobile Desire R8's key technical specifications, including the 5.5-inch Full HD IPS OGS display protected by 2.5D Curved Gorilla Glass 3 touchscreen, Dual Camera Module - made up of a 13 MegaPixel main shooter plus a secondary 5 MegaPixel lens, an 8 MegaPixel front cam for selfies with Soft LED flash, Fingerprint Scanner for quickly unlocking the phone, USB Type C port, and non-removable 3,000 mAh Li-Ion battery pack. 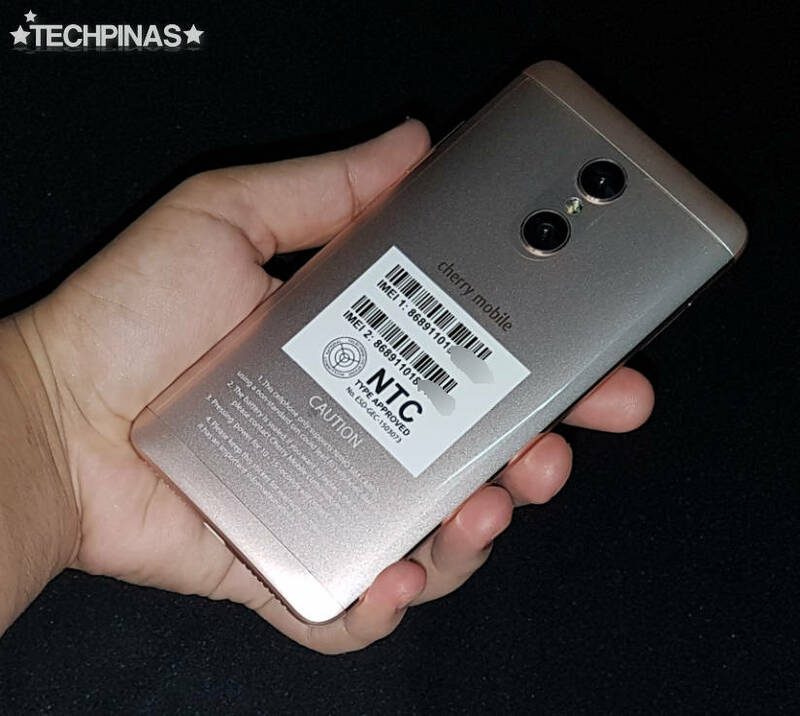 Under the hood, this Dual SIM, 4G-LTE-enabled phone runs its near vanilla Android 7.0 Nougat operating system with a 64-Bit Octa-Core 1.5 GHz MediaTek MT6750T chipset that incorporates a Mali-T860 GPU, handles multitasking with 3GB of RAM, and comes with 32GB of internal storage that can be beefed up using the hybrid secondary nanoSIM slot that supports microSD card memory expansion. This set of innards gives this model an Antutu Benchmark Score in the range of 43,000 to 45,000, which reflects decent - albeit not exemplary - 3D gaming experience and overall performance. Pulling the outer sleeve off, we see the plain black box -- which, unlike the ones for the Cosmos line, doesn't have the image of the phone printed on top. 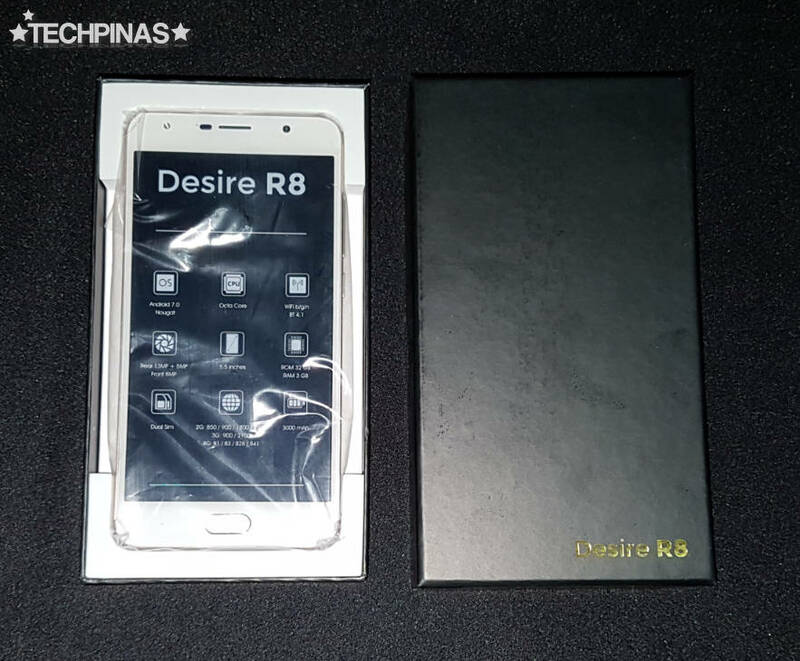 Lifting the lid, we are greeted by the Cherry Mobile Desire R8 with the familiar screen protector - showing a list of the phone's specs - and the soft foam cradle protecting the device during shipment. 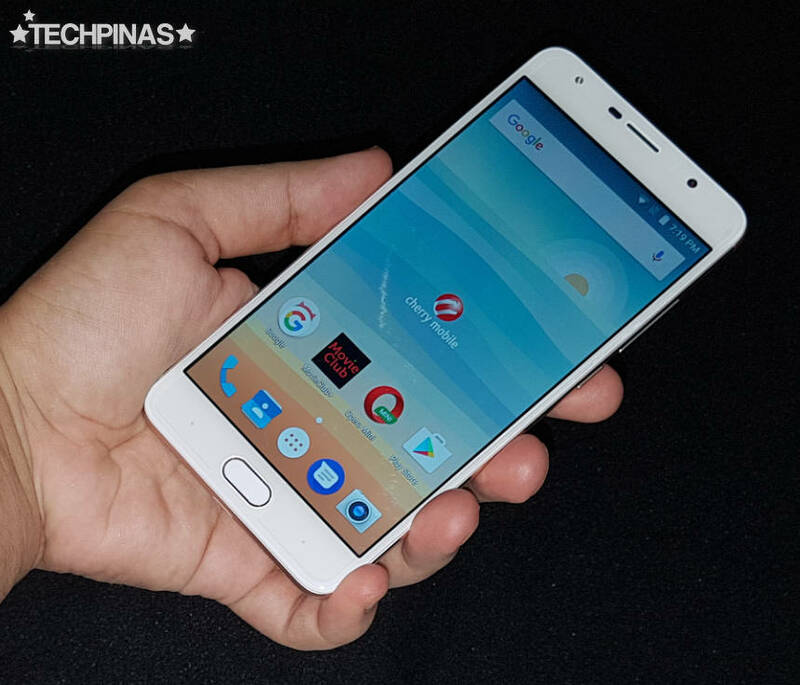 This is the complete retail package, which you can purchase for Php 9,999 at all Cherry Mobile Concept Stores, kiosks, and partner retailers nationwide. 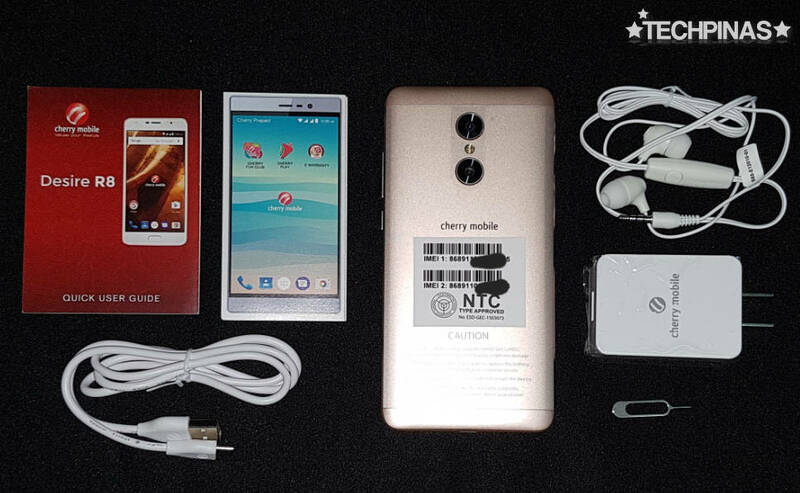 The pack includes the unit itself, the 2A charger, the USB Type C cable, user manual, Cherry Mobile App list, SIM tray ejector pin, and earphones with in-ear silicone buds and microphone. 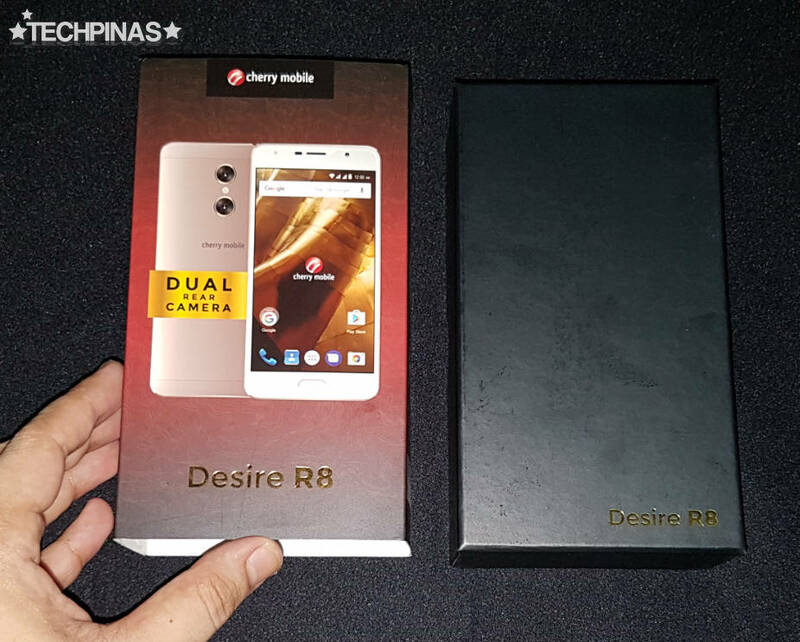 Design-wise, I'd say that the Cherry Mobile Desire R8 looks like a mash-up between the OPPO F1s and the Huawei Mate9. It has a 'square with rounded corners' footprint and its shell is made predominantly of anodized aluminum. Surprisingly, despite having a rather thick metal frame, the phone feels light compared to the far heavier Cherry Mobile Cosmos Three, which has similar build. If you're wondering, the handset's Dual Camera set-up lets the user apply interesting bokeh or depth of field effect on the photos, ranging from f/9.0 to f/0.8 for maximum background blur behind a clear subject. Join now and let your friends know about our giveaway!